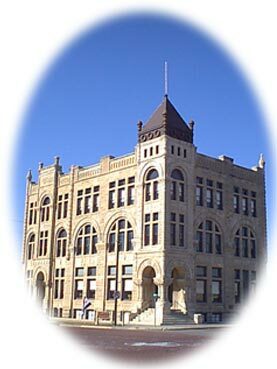 Ness City is a modern small town with small town advantages, located at the crossroads of Western Kansas. Its location places it approximately 100 miles from Nebraska on the north, 100 miles from Colorado on the west, and 100 miles from Oklahoma on the south. Highway K-96 passes through the city east and west, linking Central and Eastern Kansas with direct route to the Rockies. US-283 Highway passes through the city north and south. Both highways provide direct routes for the traveler. Ness City is well equipped to serve the traveling public as well as those working temporarily in the area. The Derrick Inn, a modern motel, is a domed structure with indoor swimming pool. A private club and a fine restaurant is there also, and there are several other first class restaurants. Ross Calhoun, the most vigorous of all town promoters is remembered as the father of Ness City. He came to the area about 1877, and during a county seat fight with Sidney (about a mile south of present Ness City) he was so adamant about locating the county seat in the exact center of the county that he tied rags to the wagon wheels in order to count the revolutions and miles. His efforts were rewarded as Ness City won the county seat. Calhoun deeded a block in Ness City for a courthouse and jail. It was not until 1886, however, that Ness City became an incorporated town. One of Beeler's most famous pioneer settlers was George Washington Carver, who journeyed by wagon from Highland, Kansas to Eden Township in Ness Countv with J.F. Beeler. The Historical Museum is housed in the old Beardslee Brothers General Store which originally was a building owned by Ross Calhoun, the father of Ness City. When a fire destroyed the building in 1899, the present building was built with supplies from the razed Calhoun House and sugar mill. Higley Cabin - "Home on the Range"